Historical Series of the Reformed Church in America, No. 50. This book tells how in 1895 the Women's Board of Domestic Missions sent a Choctaw evangelist to witness among the Chiricahua Apache prisoners of war and Comanches camped at Fort Sill in Oklahoma. Those ministries quickly expanded to include Colony, Oklahoma, and Mescalero and Dulce, New Mexico; and later, Winnebago and Macy, Nebraska. 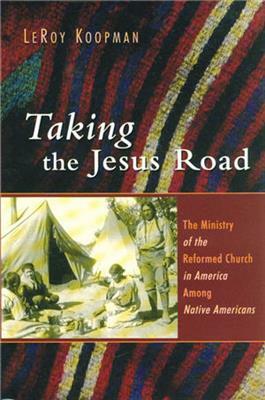 The invitation to "take the Jesus road" took many forms, including boarding schools, camp meetings, visits to scattered settlements, and traditional "Dutch Reformed" worship services. The book includes a chapter on earlier Indian mission work in New Netherland and a chapter overviewing the ever-shifting policies and attitudes regarding America's first citizens. A story of frustration and faithfulness, it's an instructive volume for anyone engaged in cross-cultural witness.